We are often asked our opinion of MBA Admissions Consulting. We believe that MBA Admissions Consulting is a valuable service that can significantly boost your chances of admission to your top-choice business schools. Some GMAT students are able to self-study and achieve successful results on their own. Similarly, some MBA applicants can successfully handle all facets of business school applications themselves. In both situations, however, the vast majority of MBA aspirants would benefit tremendously and maximize their results by using GMAT preparation and Admissions Consulting services. You should feel very comfortable working with the Admissions Consulting firm that you select and the particular consultant at that firm with whom you will directly interact. Your consultant will be a key advisor who will help you craft all aspects of your business school applications. Furthermore, you consultant will have access to extensive personal and professional information about you. If you don’t trust and like your admission consultant, the working relationship is unlikely to be productive. Carefully read through the firm’s website. Look for bios of the firm’s founder and consultants. Read testimonials from former clients. Discover what free resources and advice the website offers. It’s a red flag if you cannot easily find this information on a firm’s website. Consider what value you ultimately derive from going through the website, since a firm that delivers value on its website is much more likely to deliver value in its services. Review the firm’s latest blog and social media posts. Although less important than the main website, a firm should present timely, value-added content through these mediums. As with the main website, the firm should clearly demonstrate expertise and a commitment to providing value to you. Schedule a free consultation. Top-quality firms happily offer consultations, and a firm that does not offer a free consultation is simply not worth considering. After the consultation, assess how valuable you found the session. Did you get advice tailored to your specific situation, or were you just offered a generic sales pitch? Did you get honest feedback about your chances of admission? Did the person you speak with listen to you and respectfully answer all your questions? Did the firm’s representative seem to care about helping you and ensuring a good fit, or just pressuring you to sign up for services? Based on the consultation, you should feel very comfortable working with the firm with which you wish to proceed. Not surprisingly, these are pretty much the same criteria that we would suggest you use in choosing a GMAT preparation company. What about a company that offers both GMAT preparation and Admissions Consulting services? Although the client base is the same, the skill sets to effectively deliver these two services are vastly different. In our opinion, most companies that offer both GMAT preparation and Admissions Consulting do neither very well. There are many Admissions Consulting firms out there. Rather than present an unfocused directory of such firms, we present a curated list of what we believe are the best firms in the industry. We reviewed the websites, blogs, and social media postings of many admissions consulting firms to select those that we believe possess valuable experience and expertise that you can benefit from. Furthermore, we have spoken with a key executive at these firms to ensure that they share the values that we espouse. Although we haven’t directly used these firms’ services, we are confident that these Admissions Consulting firms strive to deliver excellent value to their clients. Please note that the firm bios presented below have been supplied by the respective companies. ARINGO Consulting has been helping professionals reach their goals since 2003, making ARINGO one of the most experienced MBA admissions consulting firms in the industry. ARINGO consultants assist applicants in choosing the appropriate business schools, developing an application strategy, writing a resume (CV) and strong essays, and selecting the recommenders who will best support their application. ARINGO also offers assistance in interview preparation and assistance in applying for scholarships and financial aid. Over 80% of ARINGO's 7+ hour clients received an offer to one of their first choice business schools, and ARINGO clients were awarded over $8 million in scholarships in the last 5 years! 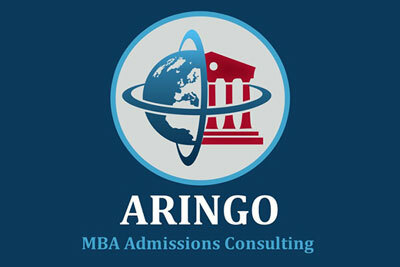 The ARINGO MBA Blog provides the latest updates on admissions and its clients' success. Wondering where you stand? Try ARINGOS's free admissions chances calculator or sign up for a free consultation.